Can you tell us more about your fashion brand, where it comes from and where the last collection originates from? Sonja Jocić: Well, the brand is from Serbia, my home country. I had previously started designing in Sweden where I did my Master’s degree at Swedish School of Textiles. I would like to say Swedish style influenced my design but also, as I finished my Bachelor degree in Serbia, it has lot of Balkan character. It is a mix of both. As I was a contemporary dancer before, I’m known for bringing always a theatrical twist to all my previous collections. The brand is about garments that are sustainable, multi-functional, constructed without fabric waste. I am experimenting with patterns that are geometrical in shape and I am using always the whole fabric, cut or draped. I use mainly natural and high quality materials, but also fabrics that are made from natural fibers combined with unnatural fibers. I using a combination because in Serbia, there are a lot of people that cannot afford completely high quality materials and by mixing the two you can also achieve a good effect. I am doing this for now, and aiming to start with using completely natural materials, but now I have noticed that most of my customers are looking for the other because they do not get as wrinkled or because of their price. I must start by small steps like in everything in your life. When did you start your brand, what year? Sonja Jocić: I started designing 2013-2014, about 5 years ago. I showed my first collection after graduating and then I launched my brand as well in 2014. Sonja Jocić: This is my 10TH collection and I wanted to sum up all the work that I’ve done so far. Knowing that, there are garments that are linked to all my collections so I used as an inspiration some of the construction pieces that were the highlights of the previous collections. It was a personal project of mine. At a point, I had decided to stop living the fast life, in fashion and in everything and I needed to do some changes. I was doing several different jobs at the time to push my brand and I started feeling like was burned out. Then I realized that this was the point I could bring this to another level. So, that is why I wanted to make a project that will help everybody that needs a change, to make them think, switch life paths and do good things for others. The first collection that I did was called dream awake and it was linked to the border line of being awake. It was more like an experiment of wearable and unwearable garments. After that I made several collections that were constructed out of zero waste patterns by using origami draping methods. 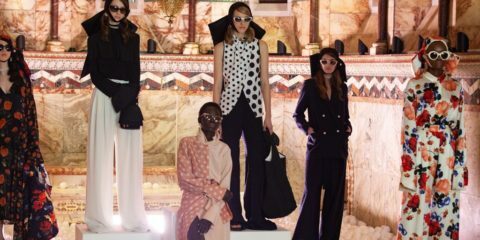 There was also a collection called 0% Bridal that was made for women that wanted to feel different and stand out in society, followed by a ‘’RE.’’ collection (React, Reflect, Redesign…) that was focused on garment deconstruction and 0% waste silhouettes. Sonja Jocić: It is a color of a shocking reminder. It is a reminder that all of us should rethink our actions. It was more like an alarm for everyone to wake up, to look at what they were doing. On one hand it was also meant to shock the observer, but on the other hand to make them feel comfortable. In a way I wanted to do this because all the customers that come to me wanted to change their lives, to feel more beautiful and confident, but also to take care about the environment. Most of the women that bought the clothes had something in their past they wanted to change, forget, or celebrate a certain moment. The clothes make them confident and always noticed. The clothes that I make are like a psychological therapy that brings your best personality out, like you are in a dream or theater, movie that you want to create. I wanted to use the red color because its intensity and psychological effect. When I made a collection in shades of just one color, the extreme focus was on a garment silhouette. I wanted to use over-sized shapes because people here don’t wear over-sized clothing and to show how elegance can be considered another way. Everyone will get noticed if it is something different, when they feel relaxed and confident, the good energy spreads. Sonja Jocić: Yes, I can. Art, zero-waste and multi-functional. I am making Art clothing, theatrical pieces with dreamlike effect. I would say zero-waste, because I use high quality fabrics and non-waste patterns. Multi-functional, because most of the garments you can wear in several ways and they make you feel creative. For example, the skirt can be a dress, shirt, collar or a cape. You are from Serbia, how would you judge the Belgrade Fashion Week? 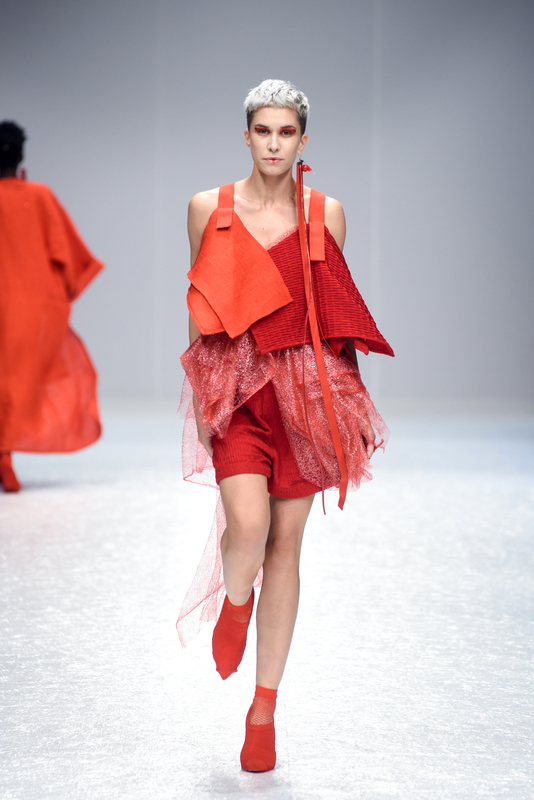 What is your impression of it and why did you decide to showcase in Belgrade Fashion Week? Sonja Jocić: When I came back from Sweden, I did not know so many people from the fashion industry. I did not know where to start from and I needed a starting platform where I can show my design to people. Belgrade Fashion Week is the best option in Serbia and the Fashion event on a highest level in the country. I applied for a contest that they had at that time for young designers, got noticed and got a lot of help from them. After that I started showcasing my collections season by season, got a lot of marketing and connections. Do you have any plan to grow your brand internationally? Sonja Jocić: Yes, first online. I would like to have a store abroad, but I am still looking for the best option. I am selling the garments online in Switzerland and I have an international online shop through my website. Now people, cannot try the clothes internationally, unless I have a presentation abroad. Would you like to sell offline, in stores? Sonja Jocić: In the future, I would like to. I would need to research the market to find out what the best place is. What is your Market, who are your clients? Sonja Jocić: Well, basically women that would like to feel confident, women that like to stand out. It can be an artist, architect, an actress, banker, writer etc. it doesn’t matter, the thing that matters is that they want to make a different move in the world or get noticed. From a designer point of view, Is there anything you have learned throughout the 5 years of having your brand that you would like to share with people that perhaps would like to work in the fashion industry? Sonja Jocić: I would say that they must be patient all the time. Patience is crucial for everything. If you are lucky, things can happen fast, but good things happen when you wait and work hard. They need to push themselves to the maximum. To give their best to bring something different to the world and work hard on their marketing. They should try to be unique, even if nowadays basically everything is invented, to try to find their own unique direction and style. Whats your opinion about diversity in fashion. We saw in the fashion show that you used a black girl as an opener, what was the reason behind that? Sonja Jocić: Well, Ornella was opening all my shows. She is a muse. I decided that she should be my first face because I like the way my clothes suit her. In Belgrade, it is not so common to have diversity in cultures and people that are not form Europe. I wanted to show that every single lady or woman can be confident and beautiful no matter where they are on this planet. Do you think that there is enough diversity on the cat walk? Sonja Jocić: No, there is not enough diversity compared to other countries when it comes to culture, region, size and other things. But you know, here in Belgrade everything is happening so slowly. Even if you try to change something you will either need to shock people or introduce everything slowly so they get used to it. It is a process. As an artiste or a designer, what is your creative process? How do you put things together from an idea in your head? Sonja Jocić: Every project gives me the inspiration, theme aim and method for the next one. The inspiration is everywhere. The method always leads me and sometimes the creativity expands so much that is difficult to stop. The moment when I stop is the beginning for the next research. I use a lot of draping and deconstruction in my design process. Sonja Jocić: I dream a lot, I am always thinking and analyzing things, sometimes even too much. I take my inspiration from everywhere. Where ever I go, I can develop a creative process. I’m a builder, every on thing leads me to another and that’s how my mind works. What is your next collection, is there any motive behind it? Tell us something exciting. Sonja Jocić: I would show how multi-functionality works, people cannot see how they can use my garments when they are on the cat walk until I show them them how it works in the atelier. I think I will focus on this as a starting point. Who would you like to see wearing your designs, celebrities, names? Sonja Jocić: I love Electronic and Underground music. I will say most of the female electronic and underground DJs and artists since is not so common to have women playing techno. I would like to see, also, confident and famous women like Winnie Harlow, Maya Wyh, Charlize Theron, Beyoncé, Ciara, Jenifer Lawrence etc. What is your next step or dream you want to achieve or accomplish? Sonja Jocić: I would like to travel to New York, I have never been. New York, because of the mix of people and cultures there. I would like to take my design to the New York Fashion Week. Tokyo would also be a dream come true. Is there any iconic designer now or from the past that made you create your own brand? Sonja Jocić: When I started designing, I would say my icon was Viktor & Rolf. I am inspired by their brave design, silhouette and over-sized shapes. Would you like to design Men’s wear in the future? Sonja Jocić: Yes I would like to. At least one piece. 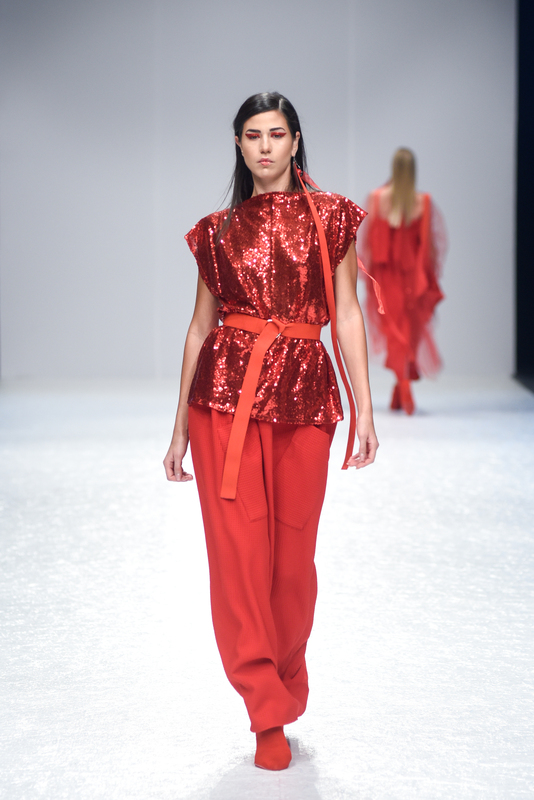 What do you think about the designers in Serbia? Sonja Jocić: I think they should be more brave when designing. 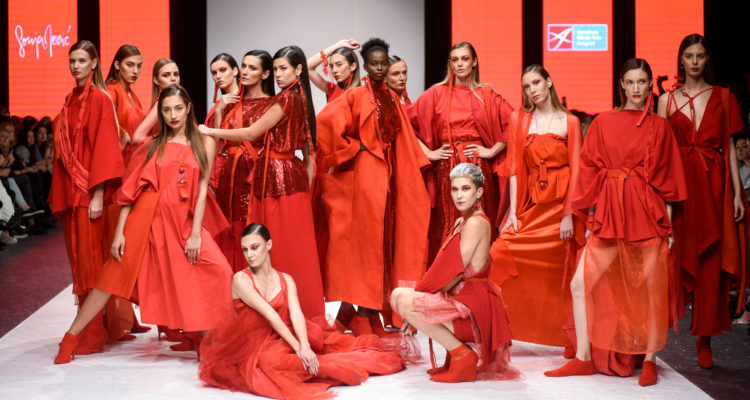 There are several talented designers but there are a lot of Serbian designers doing the same things as they see on the international catwalks. I would like them to experiment in terms of method and aim thinking, aesthetics and to be less decorative.